The graphic above has the distinction not only of attributing to the Buddha something he never said, but also of having a picture of someone who is not the Buddha. First, the figure: He’s often known as the “Laughing Buddha,” but he’s not the Buddha — i.e. the historical Buddha, Gautama. He’s Budai (Chinese) or Hotei (Japanese), and is a “Chinese folkloric deity,” as Wikipedia puts it. He may be based on a historical character who lived 1100 years ago in China. Budai often carries a sack and dispenses gifts to children. So although he’s a Buddhist figure, he’s rather like Santa Claus: a fairy-tale figure who is based on a historical figure (as Santa Claus is based on Saint Nicholas) and who is adored by kids. Imagine someone in Asia posting “Jesus quotes” (which are actually AA slogans) under a picture of Santa Claus, and you’ll get a feel for what’s going on here. No wonder Budai is laughing. And since the keynote of the 12-step recovery program is anonymity (as in Alcoholics Anonymous) it’s unlikely we’ll ever know who coined it. The phrase “suffering is optional” was used as the title of a 1976 book by Morris L. Haimowitz and ‎Natalie R. Haimowitz, suggesting that the quote goes back a long way. Even earlier formulations include the variant “misery is optional,” which is found in “The Search For Serenity” (1959) by Lewis F. Presnall — a book that was (or perhaps is) used in AA. 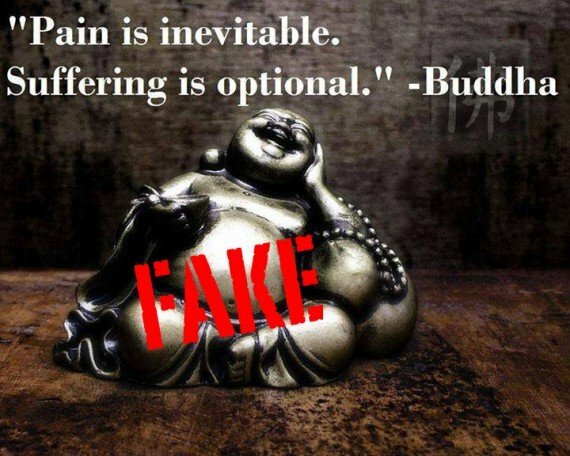 “Pain is inevitable, suffering is optional” is a very valid teaching, and consonant with the Buddha’s teaching. But it’s not something that was said by the Buddha, or Hotei, or Jesus, or Santa Claus. it is from here, maybe ? I’d very much doubt it. The quote was around before Boorstein started teaching. This is a Haruki Murakami quote. Murakami may have quoted these words, but are you sure he’s their originator? Do you have a reference for his having used this quote prior to 1983 (which is the earliest use of this phrase that I’ve found in a book)? “Oliver Queen” is just trolling – Ra’s Al Ghul is a comic book villian. Oliver Queen is “The Arrow” and Malcom Merlin is his nemisis. Come to think of it, he may have used this quote somewhere, though. Seems in character. Ah. Thank you. I’ve now watched The Arrow on TV and know what you’re talking about! I’ve seen it attributed to M. Kathleen Casey, a Canadian politician. The saying is pithy and valuable, does it really matter where it originated? Would that knowledge make it any truer or wiser? The “Buddha” is a person on the path of enlightenment. This quote is one which had been made by an someone who is enlightened. So, I guess that pretty much destroys the relevency of this website as a whole, huh? When we talk about a quote being from “the Buddha,” we mean it’s from the historical individual called Gotama, whose teachings are purported to be recorded in the Buddhist scriptures, just as a Shakespeare quote is from the historical playwright. So unless a quote is in the scriptures, it can’t validly be ascribed to the Buddha. It does puzzle me how many people there are who seem threatened by the concept of accurate citations. Thank you for your research aND insight. I get disheartened when I see social media memes by well intentioned people spreading untruths. I received a “warning” last week for women to look out for crying children bc it’s a trap for gang members to lure you into a dangerous situation. I commented that it was untrue. She snapped back with its better to be safe than sorry! To wichelp I replied No, you are breeding fear and could cause someone to ignore a weeping child who really needs help. She didn’t like it and that’s okay, but I try to play a small part in demystifying untruths if I can. Namaste.